A screenshot of the website as it was on January 25th. 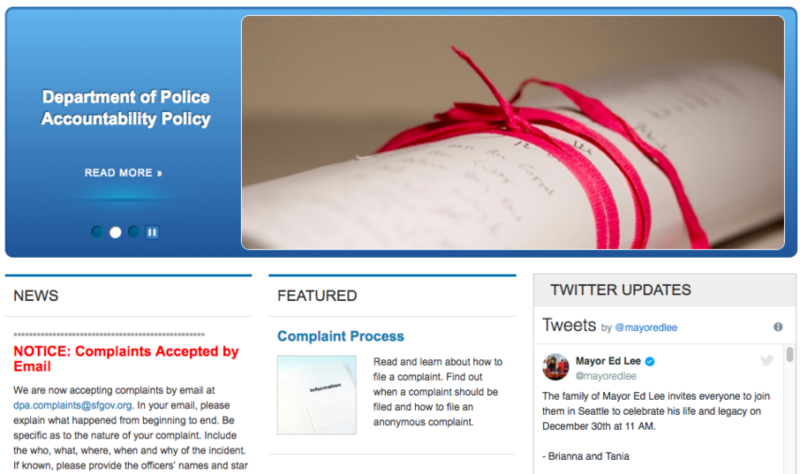 The Department of Police Accountability’s online process to file a complaint about a police officer has been offline since late last summer. And, yes, the number of complaints have declined. While online complaints comprise only a fraction of the complaints filed — most are filed in person or by phone — it is another option for filing complaints at a time when the department is trying to make the process easier. The broken website first came to light when Lt. Andy Cox from SFPD’s internal affairs, mentioned the problem at a Jan. 25 meeting of the working group that oversees the implementation of recommendations on accountability from the Department of Justice. “It was down,” the other day, Lt. Cox said to explain why he could not get to the online form to show the committee. When a Mission Local reporter looked at the site and noted that the online complaint system had been down “temporarily” since Aug. 30, he was surprised. So were others in the room. “It is a challenge to understand how it could be down for so long,” Commander Migali Ali, deputy chief of the special operations bureau, said after the meeting. Frank Leidman, a lawyer representing the San Francisco Bar Association, said after the meeting that he would be willing to loan them an IT person. By Sunday evening when we checked the site again, a new message on the upper-left column of the homepage asked viewers to file by e-mail, convenient and arguably a form of online filing. This replaced the Aug. 30 notice that the online complaint system was down. The homepage has been refreshed to ask residents to file by email. The office still has a link to an online complaint form on the page where it describes the various ways complaints can be filed, and it still doesn’t work. Until the online form returns, residents who want to file a complaint can mail or file in person at 25 Van Ness Avenue, Suite 700, call 415-241-771 or email a description of the complaint to dpa.complaints@sfgov.org. A PDF of a complaint form is here.